Daniel Benedet (getting barrelled in the photo below) is The Perfect Wave’s Surf and Yoga instructor at the Hidden Valley Resort in Bali. This elegant resort is nestled in the Bali’s southernmost part (Bukit Peninsula), just a few minutes from surf breaks such as Dreamland, Bingin, Balangan, Padang Padang, and Uluwatu. Tell us something about yourself: Where did you grow up? When and where did you start surfing? I grew up in the countryside of southern Brazil. It is a pretty great place to enjoy lots of nice beaches, plus fun waves and healthy food. With the stunning scenery around us, my friends and I were lucky to start surfing when we were still grommets. We often entered local contests just to have fun! You are quite a traveller with lots of international experience. 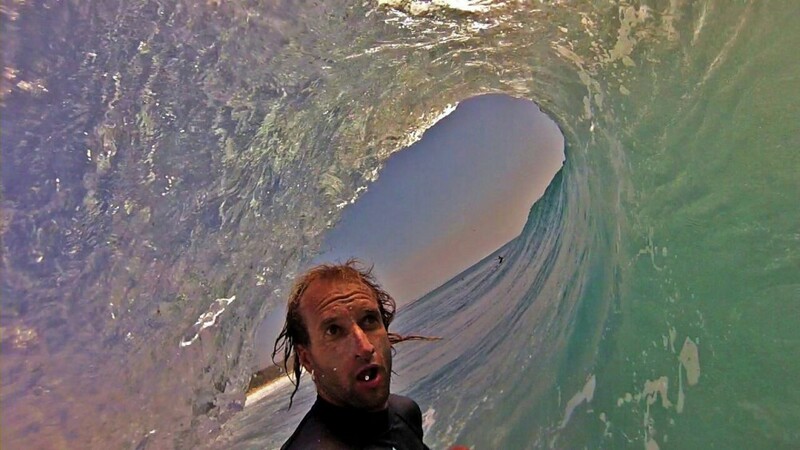 What countries have you lived in, and in which countries have you surfed? I started travelling to New Zealand. I stayed there for a couple of years and had the opportunity to surf Raglan. Raglan is a long left with powerful waves. I enjoyed my trips to Fiji from New Zealand, where I was able to surf in warm water. New Zealand was nice and it opened my mind to search for more locations with surfing and island life. I moved to Hawaii for four years, living along the North Shore in Oahu. It was an amazing experience to see the big waves. I also enjoyed getting to learn about island life. However, sometimes the Hawaiian waves gave me a bit of a scare. I have surfed a lot to prepare for other locations such as Tahiti, which has some hollow and shallow waves. I had to learn a great deal to keep from falling and getting cut on the coral reefs—but that was more of a trial and error. The last place I lived before Bali was in Western Australia. I spent three years enjoying that wicked trip! Western Australia has a raw ocean, which is kept clean and there were not too many people. I was able to focus on my life, work, practising yoga, and surfing. Now I am enjoying all Bali has to offer with perfect waves all year round! At the moment, you work as a head surf guide and yoga instructor at the Hidden Valley Resort in Bali. What are your favourite parts of the job? Yes, I started working for Perfect Wave which operates its own surf program at the Hidden Valley Resort. Here, we offer a good opportunity to match yoga with surfing to enrich all guests experience. Everyone can enjoy new adventures and stay healthy while vacationing. The project offers a new level of customer service for all our guests. We keep the enthusiasm going and help you retain your beliefs in their dreams. I believe surfing and yoga helps anyone keep to their dreams. I enjoy every day at this job because I keep focused on my health and life, which is essential. Favourite surf spot in Bali? Bali is one the most incredible islands in Indonesia. The culture and the locals are very nice and it is a very unique place. If you give a smile and respect nature, the people are warm and help you have a good time! Surfing waves in perfect places like Uluwatu and Keramas will make your surf trip a dream come true! Bali’s Bukit area has a reputation for high quality, challenging waves. Are there any spots suitable for beginners? The surf coast is long here and there are plenty of different waves for all surfing levels. It is one of the best sports to learn how to surf and start yoga. It is an experience you will never forget! What are your favourite yoga stretching exercises before a surf session? Before surfing, it is best to do a Surya Namaskara (Sun Salutation) because it is a complete exercise and warm up. In general, can doing yoga help with your surfing? Is there a good connection between these 2 activities? For sure! Yoga, surfing and music are all connected. It is about the meditation in movement, which helps keep your mind and body balanced. All yoga poses offer benefits to improve your surfing, it keeps your mind focused, and your body clean. When you go surfing, that’s what you need to get a good surf session in. What boards do you recommend surfers to bring to Bali? The recommended quiver for Bali is mostly short boards. There are perfect waves around and plenty of fun. Boards from a 5`6 to 6`3 is what most of the experienced surfers will bring with them. However, if you are a beginner or a less experienced surfer, we can hire you a variety of longer boards to use, to learn, and to get comfortable.